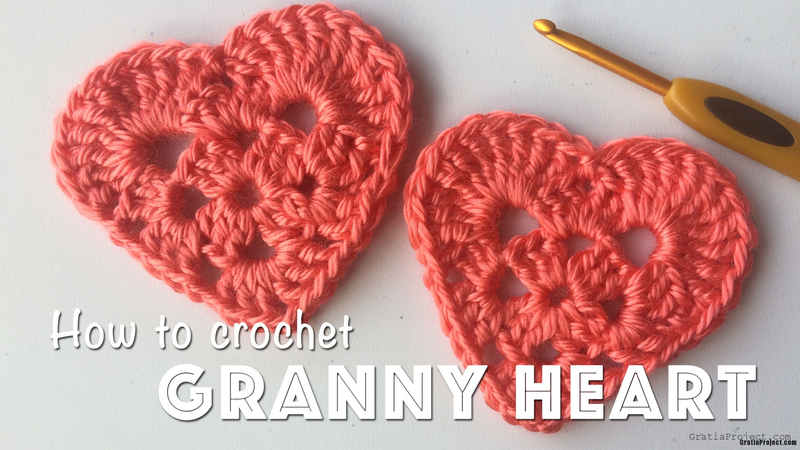 This is basic crochet granny heart. Create a dishcloth, bunting heart/heart garland, heart applique, coaster, or even scarf from this pattern. In this tutorial, I used worsted-weight acrylic yarn (Caron Simply Soft) and size 4 mm crochet hook. The finished project measures about 3×3 inches. Round 1: In a Magic Ring, ch 5. (3 dc, ch 2) repeat 3x. 2 dc. Sl st in 3rd ch of ch 5. Sl st in next st. Round 2: Ch 5. 3 dc in same space. (Ch 1. 3 dc in next space. Ch 2. 3 dc in same space.) repeat 3x. Ch 1. 2 dc in next space. Sl st in 3rd ch of ch 5. (10 tr in next space. Sl st in next space.) repeat twice. Use Invisible Join to finish your granny heart.